I play hard at being a visual artist, in fact I do it 24 hours a day, 7 days a week, every day of the year, there seems to be no off button ! Don’t get me wrong my play can get pretty serious, challenging and exhausting! Actually I started making art because I could express my more “heavy” and “intense” feelings without feeling like a freak, when I went to art college I met many intense characters! I tend to be a very serious person, though I can be very silly too! So my art tends to be very seriously playful! The work part of my practice is the other stuff that I have to do as an artist but I try to keep “work” out of the whole process of making art. We are obsessed with working, we work too hard and too much we should be living instead. Is this why to be a successful artist nowadays you have to spend way more time working on you career than making your art? I want to stop calling my art “my work”. Art for me is inventing a new visual language, shape-shifting between different disciplines, merging art and our everyday life and going beyond it into fantasy and looking back into the past, all at the same time. Art is attempting the impossible, failing, achieving something unexpected, balancing our own will with chance. It is playing with life and exploring the world around us. Art is working on a personal level and a universal level without interruption. Art for me is about transformation, the process of art is transformative and I choose materials that are not considered “valuable” and through the creative process I aim to transform the simple materials into something meaningful and inspiring, drawing attention to the creative process. I invite the viewer to take a journey, and perhaps to feel this too. Art for me is about waking up fully. I don’t want the audience to marvel at my talent at drawing or painting because I am so precise, for me that gets in the way. I would like the viewer to come away from my art feeling something, maybe inspired to be creative and inventive and imaginative and playful themselves. I have not set goals or aims for my art, in how it effects the viewer, I do think about it from time to time but I cannot control its outcome. The whole process of of my art is a game of control and lack of control, intention and accident, logic and intuition, knowing when to push away or pull towards, so inevitably this sort of dialogue will continue when the art leaves my hands too. I think these transformative acts ripples out into the universe in many ways. 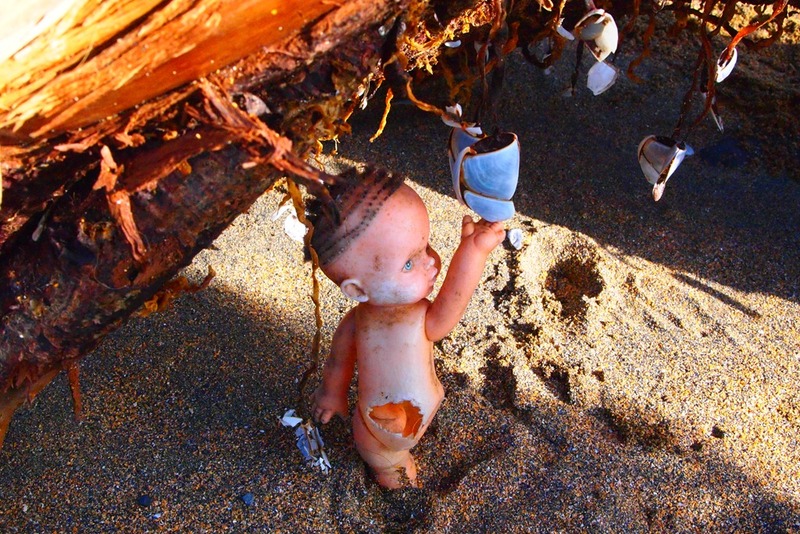 I found this doll and driftwood with goose barnacles hanging off it last February. 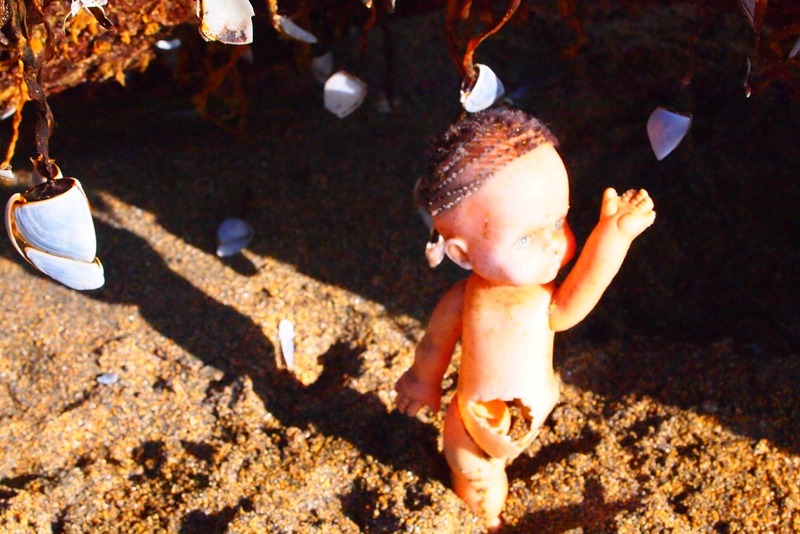 It was on my Birthday, I was walking on Fanore beach, it felt very apt and kind of funny, to find the little doll. 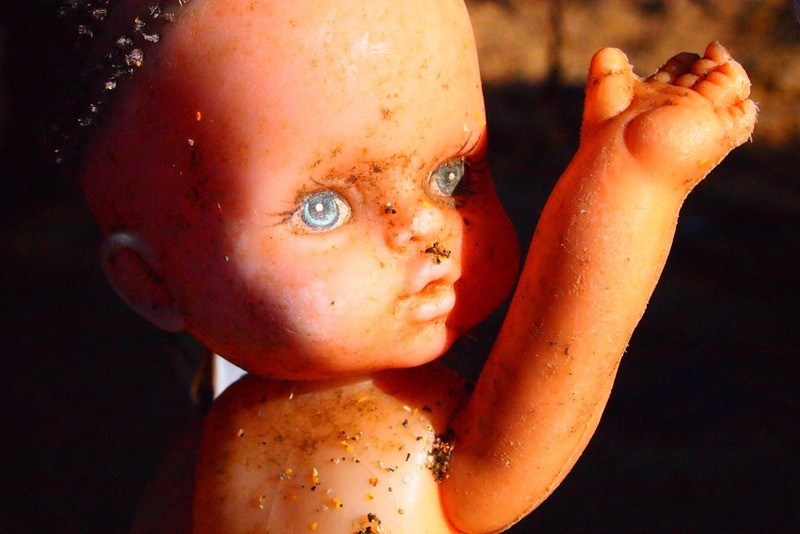 So I lifted up the wood and placed the doll standing up underneath it, as if reaching up to pick a goose barnacle. The doll is one legged but is able to feed herself, it is a very unlikely situation! As was the chances of each of us being alive as a human being today on this planet, I have heard some very mind blowing comparisons of how unlikely our existence was, the chances of each of us being here and alive today as humans were extremely small. All of these weird and wonderful thoughts filter into my art somehow, often in very unexpected ways. The journey into the unknown is what keeps me making art. I really like going to a place and finding stuff that I would have never imagined being there, and doing something creative with it. I love being nicely surprised by the whole art making process. « Is There An Artist In The House? I’m so sorry to be missing your exhibition tomorrow night Marianne – I like your work very much. I’m in Kilkenny hanging my exhibition – opening Saturday at Watergate Theatre. Hi Judy good luck with your exhibition tonight!Thank you I am glad you like my work. Sorry I thought I approved your comment already but I am no wizard with tech to say the least. I would like very much to see your work sometime.